This postcard from around the 1970s is double the size of the ordinary postcards shown elsewhere in this collection, and contained a much more detailed description of the view on its reverse side. Once again, a way of providing more space for the message, like the lettercard. 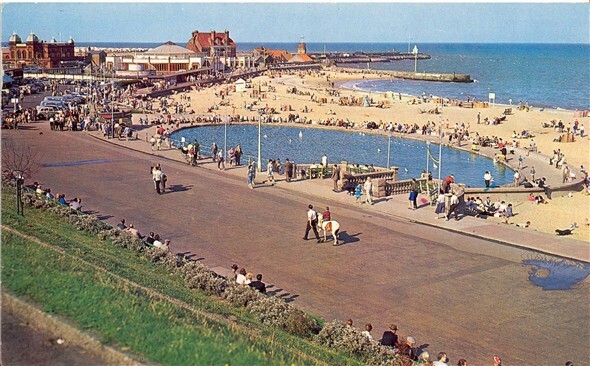 I am sure this postcard is earlier than the seventies as I am 51 and cannot remember the pier like this. It had the coastguard and port control building on the end as it is now. Mr. Saunders was right as the old "Pepper-pot" on the end of Gorleston Pier was demolished in 1963 when the Pier was also broken up. I certanly missed the "Cosies"..I was 33 when we lost our old Pier.